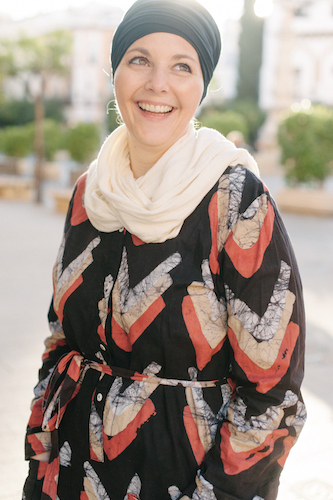 This destination guide comes from Pauline Brettell of the website Tea in Tangier. She and her family called Asilah home and she is offering up her expert advice to you! Our very first family trip to Morocco was hinged around a few images, a tent in the desert, the food stalls at Djemaa el Fna in Marrakech, and a beautiful medina house overlooking the Atlantic Ocean in the small town of Asilah – incredible that this riad, several years later, would become our home for a year we spent living in this tiny seaside town of northern Morocco. 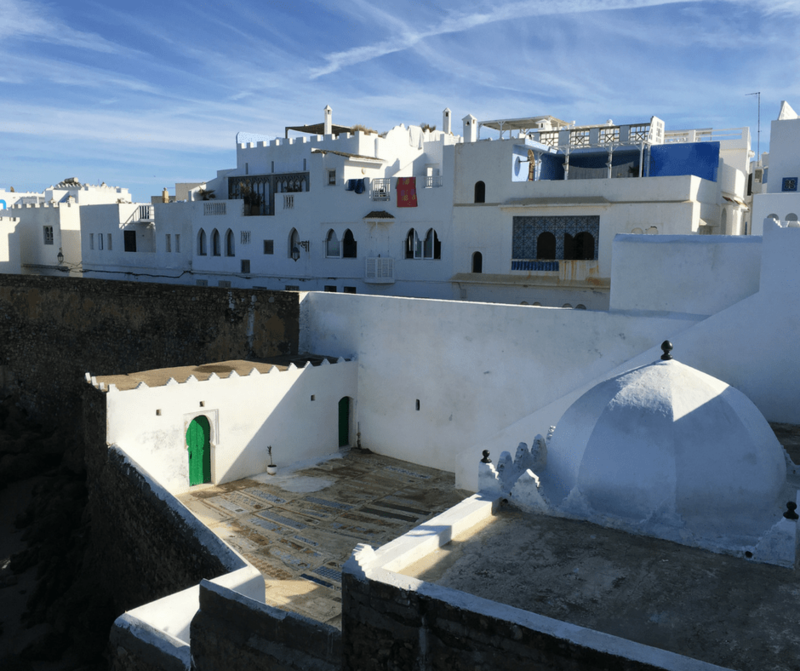 Asilah is in many ways the antithesis to cities like Marrakech – possibly because it is lulled into a slower pace of life by the constant crashing of the waves against the medina ramparts. Its proximity to Spain has also had a major influence on the culture and cuisine there with Spanish often being spoken as a second language before French. It can be found just “down the road “ from Tangier – a city I have grown to love over the years although I do think, that like any big city, it can be difficult to navigate as a visitor, and I often recommend that first time visitors head straight down the coast to Asilah as it really is the gentlest of introductions to life in a Moroccan medina. Touchdown at the appropriately named Ibn Battuta Airport in Tangier, walk out the doors onto the roadside and hop into the taxi at the front of the queue, and 45 min later you will be at the entrance to the medina of Assilah – the taxi fees are set (give or take a few dirhams) and I have never had to deal with hard negotiations there – which is always a good thing on arrival in a new country! Although in many ways it is a sleepy little town (well, out of season that is) there is everything you need for your holiday from banks to a pharmacy, post office and mobile phone companies. There are two markets – a small one along the town side wall of the medina, and a larger one with great fresh produce in the main square – as well as weekly village markets for the stronger hearted. “Monday Market” being the biggest in the area where you can get everything from a haircut, to a goat to a donkey saddle. Reaching Asilah by car is very easy as it is just off the A1 tollroad from Rabat to Tangier. The exit is very easy and the road will lead you to central Asilah. It’s possible to rent a car and self drive, hire a driver and car or take a grand taxi to reach the city. You should expect to pay a minimum of 200 dirham for a grand taxi from Tangier to Asilah. If you’ll be coming from further you can take a grand taxi but it would be worth looking into the costs of a private driver for more comfort. Asilah is also on the train line. You have the option to take the train from the Tangier station to Asilah or from other connecting cities. The train in Morocco runs on one line but not all trains stop at all stations so you’ll need to double check. The cost of a ticket from Tangier is around 30 dirham depending on class of service. Limited bus service runs to Asilah as it is serviced by the train. CTM buses do go to the city but will depend on your starting point. If your starting point has a train connection then there likely is not a bus connection. There are public buses in all cities that could go to Asilah but their service is not standardized and while very inexpensive can be difficult to use. The closest airport to Asilah is in Tangier. More and more carriers from Europe are flying into Tangier so this is an option. Likewise the ferry service from Spain will bring you to the port of Tangier where you can get a grand taxi to Asilah or a petit taxi to the Tangier train station and then take the train to Asilah. Seeking a great Asilah beach? There are lovely beaches in and around the town and in summer the place quite literally heaves with both Moroccan and foreign tourists and beach goers, with umbrellas, straw hats and other beach accessories being sold on every corner – my advice is, if possible, head as far out of town as you can manage for the best and cleanest beaches. A firm family favourite, although it is a bit of a drive, is Sidi M’Rait. In the summer months, there are a few pop-up Chiringuitos on the beach offering parasols and chairs and serving food and drinks. Pack a basket and make a day of it. Another major attraction is the annual Asilah Arts Festival that takes place every summer – this showcases both visual and performing arts and although there has been some criticism levelled at the festival in recent years over the lack of community involvement, it remains a high point in the town calendar. 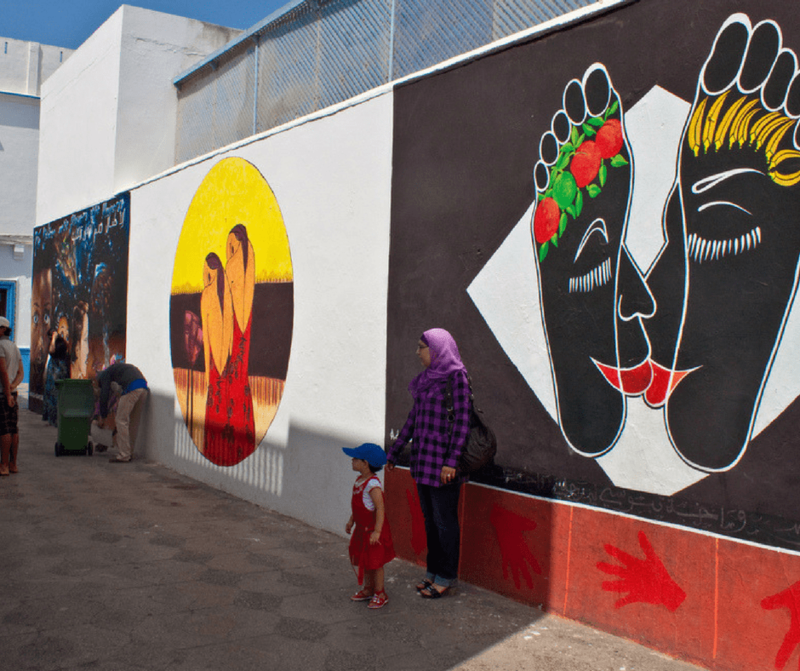 One of the most visible aspects of the festival are the murals and street art graffiti in and around the medina walls. Every year, just before the festival, the walls are whitewashed and – quite literally – a clean slate appears for the selected artists. Murals are then painted on the walls in the lead-up to the festival, where they remain for the duration of the year until they are painted over in preparation for the next festival! So even if you miss the festival, a wander around this pretty medina at any time of the year should provide you with more than a few Instagram-able photo opportunities! 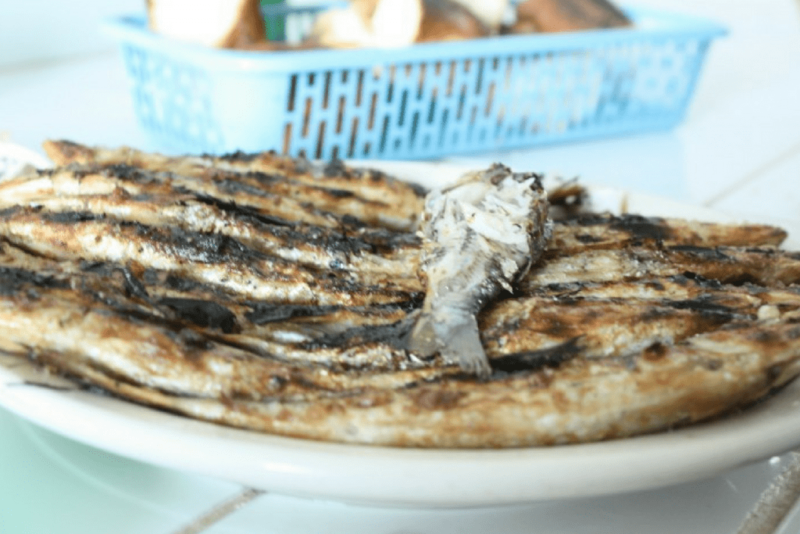 There is no shortage of restaurants in the town, but, if being truthful, most of them have a very similar menu; sardines, fresh fish, a tagine or two and spaghetti for the less adventurous. However, Casa Pepe, on the corner just up from the main entrance to the medina has been around for years and serves a good Moroccan/Spanish mix of food with both Spanish and Moroccan wine. Speaking of wine – there is a small bottle store just around the corner from the pharmacy that is open all year excluding the month of Ramadan. Along the outside of the medina there is a road of “hole in the wall” restaurants that serve tables set out across the road – there you will find a range of traditional street food like bessara and harira soup, tagines and fresh grilled fish and meat – they seem to change from season to season so it is best to wander along and see what looks fresh on the day. For something a little more upmarket – and the best oysters in town – head along the boulevard to Port XIV, and if you are lucky, owner Karim might be mixing a few cocktails to go with the oysters! Some of the best food comes out onto the street in the summer evenings – take a walk out of the medina up into the main road of the town at around 6pm and you will find the street full of people selling and shopping – fresh bread, savoury and sweet pastries, cheese, freshly squeezed juice, fresh potato chips, olives . . .all perfect for taking back to your roof terrace to enjoy with the sunset! 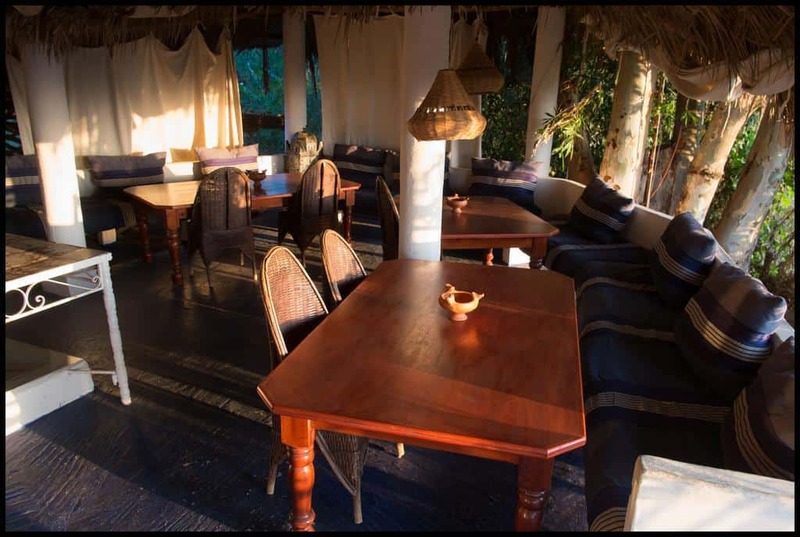 If you are traveling on a budget the B&B Christina’s House at the top end of town is a good option – and has the advantage of being just around the corner from the hammam. If you are really looking for a quiet country retreat head into the hills and stay at Berbari. You will need a car or private driver to get you to and from this destination. 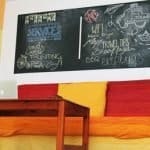 For backpackers or those just seeking inexpensive accommodation there is a hostel in Asilah. They offer limited private rooms as well as six-person dorms and eight-person dorms. Breakfast is included and the hostel also organizes activities for guests. 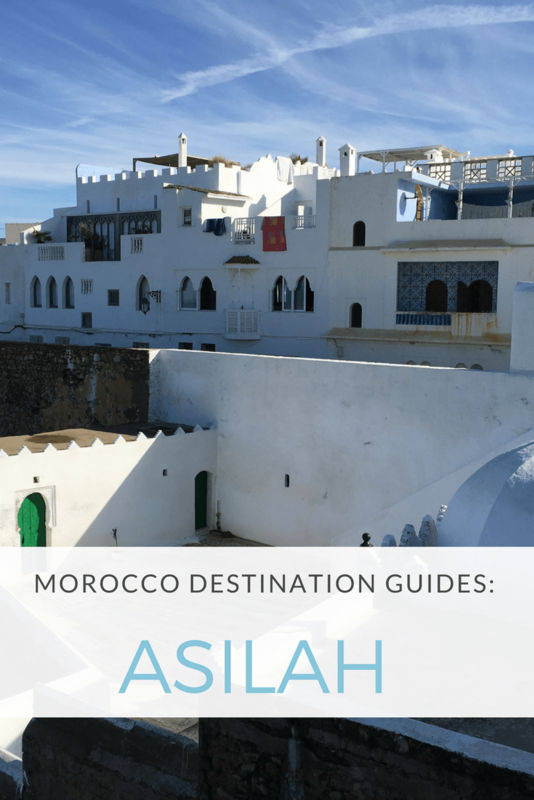 Asilah is very easy to reach and explore on your own however if you would rather have a driver and guide to help you make the most of your day in Asilah it can be organized. Head 25km south of Asilah and you’ll come across the Mzora (Msoura) stone circle. The circle consists of 167 monoliths surrounding a raised earth mound. Legend has it that this is the burial mound of Antaeus a figure in both Greek and Berber mythology. In Berber mythology he is known as Anti. It’s believed the same people who constructed this site are related to those who did the same in Britain, France and Ireland. The site is not well known and can be difficult to reach but with a local driver it’s possible to find. 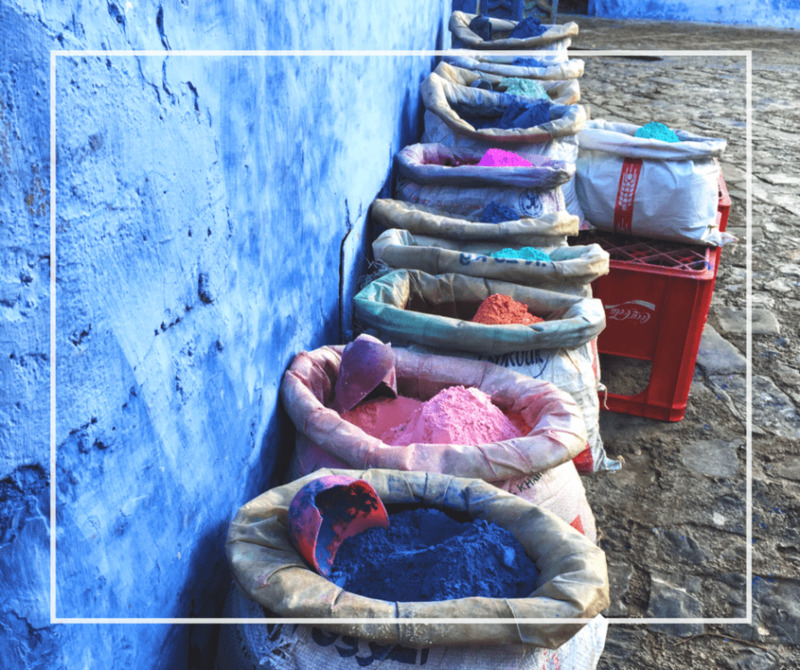 For another great city in northern Morocco head to Chefchaouan. You could combine it with a trip to Asilah though the two are some distance apart so you’ll want to budget your time accordingly. Both are small cities that offer a laid-back way of life. Some people compare Asilah and Essaouira to one another. They’re in different areas of Morocco so if you’re only headed to the more southern regions, Essaouira might be a better city of choice. Both have the same relaxed, coastal vibe with a heavy presence of art and lots of fresh seafood. Ultimately a holiday in Asilah is all about a slower pace, about strolling through the medina in the mornings as the shopkeepers are opening (and trust me that’s not early!) and finding a favourite spot for your morning coffee, before even thinking about the rest of the day. 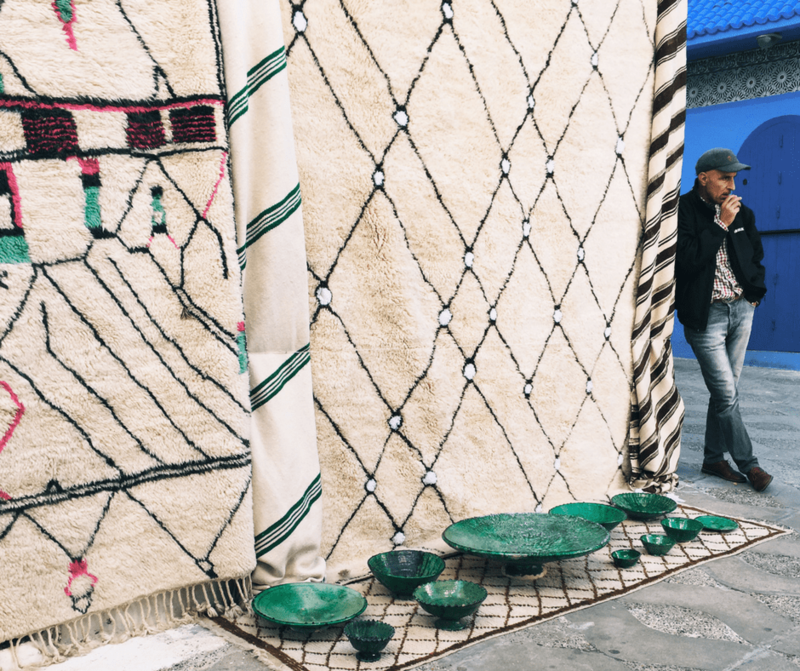 If you’re looking for more places to stay or advice in general about Asilah be sure to check out Tea in Tangier. Asilah sounds like a lovely place to unwind after getting in the thick of action in Tangier, Marrakesh and Casablanca. Small town vibes are my favorite.